I was speaking to a group of eager young students at the Punjabi University, Patiala the other day. The general theme was Jain painting, and the talk veered, inevitably, towards illuminated and illustrated manuscripts, which are among the glories of the Jain tradition. Questions of scribal practice, calligraphy, paper-making, binding systems, naturally came in, and attention went inevitably, once again, to another great tradition—the Islamic—with its remarkable emphasis on the art of the book. We were suddenly in a very different world, that of books which bore the luminous imprint of good taste. The routine, workaday books that keep rolling off printing machines and that one lives and works with today share very little of that quality, or that sensibility. But it was not always so, it would seem. For at the very beginning of the age of printing in the west was produced what is still regarded as one of the greatest books ever produced: the Gutenberg Bible. 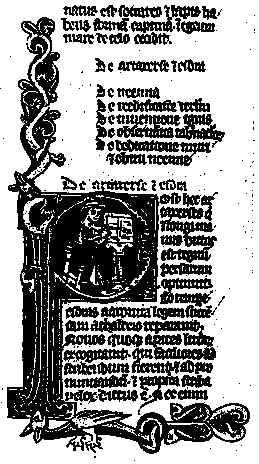 I have had occasion earlier to write, in this very column, about the German inventor of the 'movable type', Johannes Gutenberg (ca. 1400-1468), but one has to read the writing of celebrated bibliophiles and designers to get a sense of the respect in which the great Bible he printed in about 1456 has been held over the centuries. Consider what Stefan Salter, America's foremost book designer, wrote some years ago in one of his columns: "I want to say here that no matter what the value of a Gutenberg Bible—and there are other more valuable books—I have never seen better book design, type design, page layout and presswork. I have also seen many beautiful manuscripts, but nothing has ever thrilled me more than this great work of art. During the next 500 years, many printers in many lands invented better presses, designed new typefaces, many of great beauty. There were, of course, fashions and trends, experiments, new concepts of typography: but some basic facts remained. Facts such as the proportion of a book page, the printing in clear black ink on good white paper, the traditional harmony of centric design." And in these the Gutenberg Bible has seldom if ever been excelled, in his view. From here, Salter goes on to speculate what must have been going on in the life of Johannes Gutenberg as he went through his years of planning and executing this great project: the perfection of a type face that could pass for the handiwork of an accomplished scribe; the designing of an alphabet, many abbreviations or ligatures, capital letters and small initials; the leaving of the large initials to the great skill of the finest scribes, in fact to the painters of the period, some of them famous but preferring to remain anonymous in that industrial occupation. It did not happen immediately after Gutenberg, and not in Europe alone, but slowly the joy, and the art, started ebbing out of book production, quick turnovers and profit margins coming in. The machine began to dictate taste, and mechanization both of skills and minds became a fact. Till, of course, even in this field, there was revolt of a kind, the realisation, at least on the part of a few people, that a power-driven machine is not necessarily superior to a tool in the hands of a skilled craftsman. Nothing demonstrates this better than the career and the labours of one distinguished Victorian-age man, William Morris (1834-1896): painter, designer, poet, and socialist writer. The loss of beauty and dignity in printing angered him, and made him sad. Essentially, he wrote, "a book, printed or written, has a tendency to be a beautiful object", but "that we of this age should generally produce ugly books, shows, I fear, something like malice pretence - a determination to put our eyes in our pockets whenever we can ...". Reacting against this, he began printing books with the hope of producing some which would have a definite claim to beauty, while being easy to read. I am fond of colophons: Among these my favourite continues to be the one in Sanskrit in which a prayer is placed in the mouth of the just completed book: "Protect me, Lord, from fire, from water, from oil, and from insects. And save me from falling into the hands of a fool!"